My boys are most happy when they are creating something. If that "something" is a mess, then so much the better! Some days I wish I was the kind of mom who spent all day making crafts or baking with the children. Before kids, I certainly spent hours and hours hand making little gifts to give my co-workers, most of whom were parents who thanked me and said they wished they could go back in time to when they didn't have kids and could sit around hand making gifts... It's only now, ten years later that I understand their wistfulness and longing. For Christmas, we are indeed making a few things, most of which I can't post photos of until after the gifts have been opened by their Boy-Wonder-Blog-reading recipients! I will show you a couple of things. 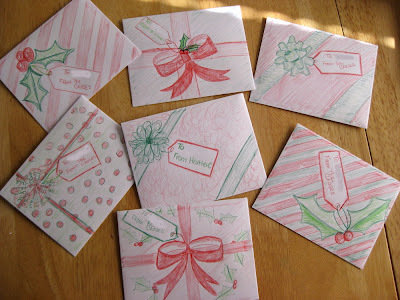 I drew some gift wrap onto envelopes to add some warmth to the cold hard cash they contain (I blurred out the names so no sneaky relatives can guess what they are getting). 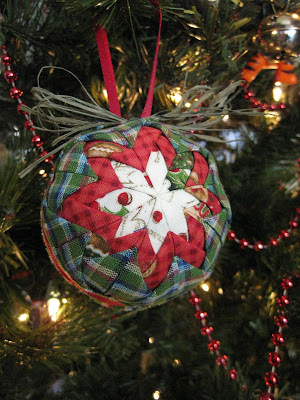 And we made some quilted fabric ball ornaments which only require a Styrofoam ball, ribbon, fabric, and a bazillion straight-pins. Oh, and about thirty minutes. This one is for our next door neighbor (who doesn't read this blog). I am planning to do some things with the kids like cookie decorating and such. What I really have it in my head to do is to make our own marshmallows! I know, nothing like picking an easy project, right? 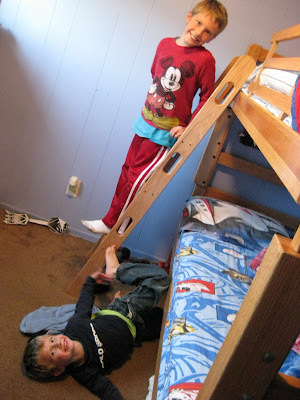 The boys are more than just a little excited to have two weeks off from school. We are ALL really excited that we'll have Chris home, along with his wife, Alyssa for one week. It's finally starting to feel a little bit like Christmas! wow - way impressed with the ornaments!! !